24.05.2016 (Hvino News). 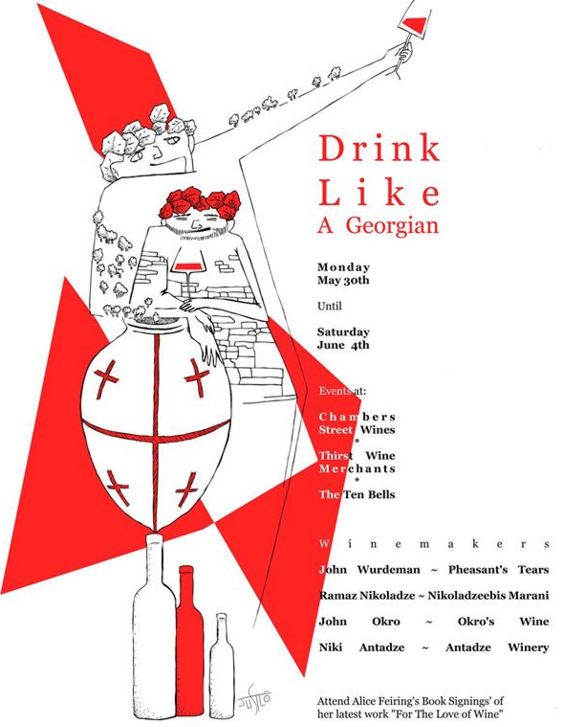 "Drink Like a Georgian" presents a week of Georgian wine events in New York City running Monday, May 30th, through Saturday, June 4th. Participants will have a chance to meet Georgian winemakers Ramaz Nikoladze, Niki Antadze, John Wurdeman and John Okro (Okruashvili), and to attend Alice Feiring's book signings for her latest work "For the Love of Wine" about her adventures in Georgia with these winemakers and Georgia's remarkable wines. The wine stores and restaurants will be posting individually the details of "Drink Like a Georgian" events, which they will host.